I love how food can make us think of special memories and traditions, and in our family, one food that is tied to pretty much every celebration is Homemade Vanilla Ice Cream. I thought this would be perfect to share today as part of one of my blogger friends, Ally's, virtual baby shower. Ally blogs at Ally's Sweet and Savory Eats where she shares lots of simple and delicious recipes. She is expecting her third child in mid-May, and Yudith at Blissfully Delicious and Steph at Been There, Baked That thought it'd be great if some fellow Iowa Food Bloggers put together some recipes for a virtual baby shower for Ally. You have to use a good quality vanilla. I feel like you can never go wrong with Watkins Vanilla. You need to use a classic, 4 qt. or 6 qt., electric ice cream maker like this one. In my opinion, the older, the better. I actually use a hand me down ice cream maker from my in-laws that they got at the beginning of their marriage. Whisk eggs, sugar, salt, vanilla and half & half together. Pour into canister. Then pour whole milk up to fill line. Put canister into ice cream bucket with ice and ice cream salt around canister and let run 30-40 minutes until thick and smooth. Enjoy at your next celebration! Congratulations early to Ally and be sure to check out the rest of the virtual baby shower recipes by checking out both Yudith and Steph's host pages. Michelle at Simplify, Live, Love, Kierstan at Life in Iowa, Jenny at In The Kitchen with Jenny and Jenni at Jenni Eats are also all participating in today's virtual baby shower. When you think about planning a baby shower, what foods would you include? Remember to Comment for Cause! I can't picture myself ever making ice cream when it's so available. I'm not one to spend much time in the kitchen. I have had homemade ice cream made by someone else though, wasn't that impressed with it. I love home made ice cream! I have great memories of making it with my dad and it was always a fun time! I totally flaked out on the virtual baby shower. My head has definitely not be in the game lately when it has come to blog reading and commenting. Spring is calling me maybe a bit too much! Great recipe from the looks of it! Thanks, Val. I have great memories making homemade ice cream and hope my kids will too. My grandma's brother owned a dairy that specialized in ice cream. when we had family get togethers, my grandpa would pick up a 5 gallon canister of vanilla in a dry ice chest as our contribution. Nothing like a family picnic in the park with the awesome desserts and ice cream! Heavenly, we rarely ever had any left to take home. But Uncle Bill was always willing to make us a small canister for home. Love homemade ice cream! Something about the taste and texture that makes it wonderful. Thank you for joining the Country Fair Blog Party week #11! I have to agree Laurie! I'm happy to be apart of the Country Fair Blog Linky Party! We are making this tonight. Churning as I type. There is nothing better than homemade. Store bought does not compare. I love to hear this! We made some earlier this month and I had a bowl tonight ;) I love it fresh but I think this recipe freezes pretty well too. 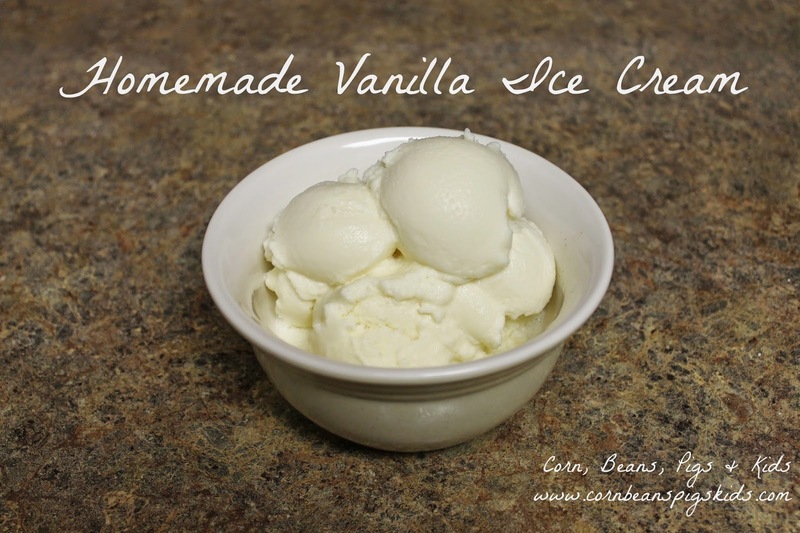 There is nothing like a bowl of homemade vanilla ice cream. I wish I had some now!